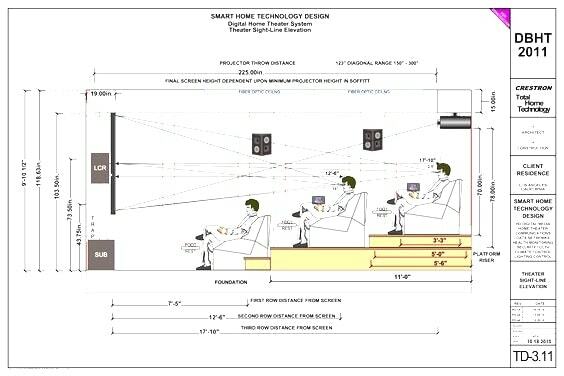 Is it right to say that you are considering building your own home theater? Or designing a custom home theater? OK! Get a kick out of knowing what it takes in designing a home theater room! That is, a room that’s able to make movies as life-like as possible! A home theater may be defined as a combined set of speakers and audio-video components placed in a customized room. Or, a movie theater-like experience in a private room. Seating is deliberately situated to permit unhampered view, with appropriate lighting in the room. Yes, home theater installation is not a difficult task. However, in order to have a perfect experience you need to consider a few elements before you start. Looking at the selection of the appropriate screen size, go by the adage bigger the screen, the better the resolution. One has to choose carefully the screen of optimal size. Do this by considering the distance between the first row of the seats and the screen. Also, the type of screen and most importantly the viewing angle should be considered. According to experts, the vertical viewing angle should not be more than 35 degrees. As far as the size of the screen is concerned, the smaller screen doesn’t make an issue. Other than perhaps, you will simply end up wishing the photo was bigger every now and then. However, choosing a very large could lead to serious consequences. Such as, headaches, eyestrain and fatigue. You could end up getting tired of your own home theater since you overestimated the screen size. In the case, your home theater is near your bedrooms then there may be an annoying noise that you don’t want to hear in other rooms. The best choice for the home entertainment installation is the basement if you have the one in your house. It is ideal for home theater because it is away from the rest of the family’s activities, and little natural light. To have a true cinema experience, projectors along with the screen are more favorable. However, Televisions are easy to understand, simple to install and have a decent picture quality. In fact, TVs come in grand sizes today with curved screens and you can easily find a TV up to the size of 85 inches at a reasonable price. You need a dark environment when viewing with a projector while TV can be used in daylight. Moreover, the TV has no maintenance, whereas the projector’s lamp needs to be replaced after a certain time. Not to mention, it is a fragile device. In a way, both TV and Projector have their own pros and cons. So you have to choose one by considering the light situation in your room, the screen size capacity proportional to your room, and finally your budget.